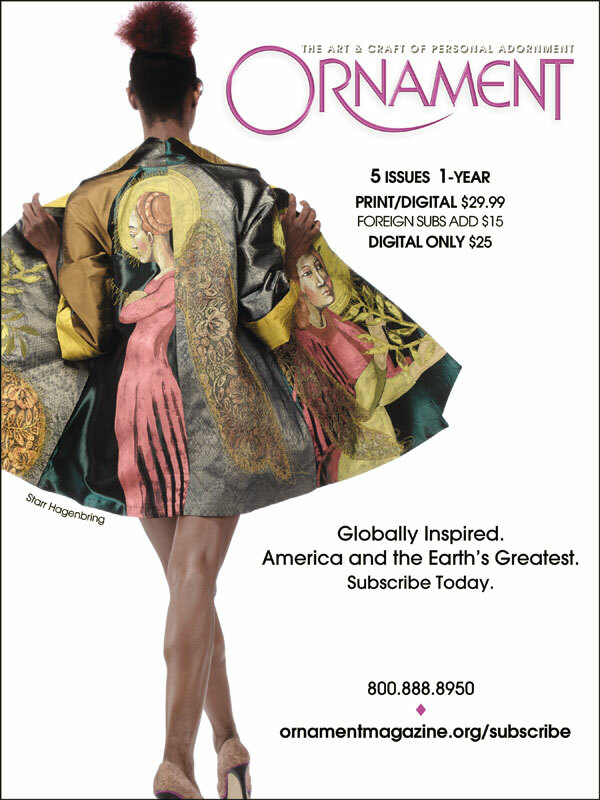 Carolyn L. E. Benesh is Coeditor of Ornament, and a raconteur singing the ballads of contemporary wearable art. Benesh and her husband, Robert Liu, founded the magazine back in 1974, when it was first called the Bead Journal. As the journal's subject matter evolved from beads to personal adornment of all types and stripes, the name changed too, becoming Ornament. Benesh retains an itinerant streak, and travels all over the country attending craft shows and visiting museums and galleries. Her two favorite haunts are Washington, D.C. and Philadelphia, where she annually makes her tour of the Smithsonian Craft Show, and the Philadelphia Museum of Art Craft Show. Robert K. Liu is Coeditor of Ornament and for many years its in-house photographer. His passion is beads, as well as jewelry; he is especially interested in ancient glass and faience, their techniques, meanings and trade, which extends also to ethnographic jewelry. His book, The Photography of Personal Adornment, covers forty plus years of shooting jewelry, clothing and events related to wearable art, both in and out of the Ornament studio. Recently he has been teaching one-on-one photography lessons at the Ornament office, as well as teaching workshops on heatbending black bamboo jewelry, and heatshrinking polyester coverings over wire matrices. He also lectures on these topics, juries competitions, referees articles and occasionally does consultations. Patrick R. Benesh-Liu is Associate Editor of Ornament and continues to find time to enjoy craft in between writing, travel and tech support. He has been full-time staff with the magazine since 2005, and a cover model since 1986. His focus is in contemporary craft, but ethnographic art is no less of interest. The holistic breadth of human creation is all tied together, whether past, present, or future, and its current state and where it is going is his fascination. As Ornament’s reporter, he also provides a zesty compilation of the latest news in craft, where you can find out what is happening with art to wear in the global neighborhood. Stephanie Schreiber first worked with Ornament Magazine back in Winter of 2002 as its new Art Director, and helped orchestrate the magazine's layout and design until 2009. She would shortly afterward fulfill her dream of moving to the Big Island of Hawai'i, where she now telecommutes through the vast highways of the internet to collaborate with Ornament again as its Design Consultant. She grows delicious coffee and macadamia nuts on her property, listens to the birds each morning, and titillates herself with the local fauna's antics. She is also a practitioner of qigong and universal peace and harmony. Robin Updike has followed fashion in one way or another for most of her life. She has written extensively on fashion exhibitions and always has her own particular take on both museum exhibits and artists alike. Updike has a gift for relating the personal to any subject, and her anecdotes from her own life are both insightful and poignant. She is especially happy when writing about jewelry and costume. Based in Seattle, Washington, Updike, a regular contributor to Ornament, also writes about art, style and wine. Carl Little is a writer and poet who is a prolific member to Maine's literary community. He also offers his own judicious perspective on art within the pages of Ornament Magazine. Little is one of twenty poets featured in a series of videos produced during Maine poet laureate Wesley McNair’s tenure. They can be viewed on the University of Maine website. His most recent book is Wendy Turner—Island Light, which is but one of his sizable list of literary and media offerings. He makes his home in Somesville on Mount Desert Island. Kimberly Chrisman-Campbell is an art historian specializing in fashion and textiles, and a frequent contributor to Ornament. Her background has given Chrisman-Campbell a watchful eye, and her astute and insightful coverage of museum exhibitions often has a few critiques regarding thematic coherence or how the exhibition is laid out that are delivered concisely and with aplomb. She has worked as a curator, consultant and educator for museums and universities around the world. Chrisman-Campbell is the author of Fashion Victims: Dress at the Court of Louis XVI and Marie-Antoinette, published by Yale University Press. Glen R. Brown is a professor of art history at Kansas State University and a frequent writer on jewelry and metalwork in Ornament Magazine. His intellectual and contemplative approach to art often leads to intensive introspection on the nature of the work, and of the artist who made it, all tied together with a voluminousness of vocabulary that clearly illustrates Brown's credentials as a wordsmith. His passion is ceramics, but his keen insight is just as well applied to wearable art. Ashley Callahan is an independent scholar and curator in Athens, Georgia, with a specialty in modern and contemporary American decorative arts. The University of Georgia Press published her book Southern Tufts: The Regional Origins and National Craze for Chenille Fashion in December 2015. She grew up in Dalton—known over time as both the Bedspread Capital of the World and the Carpet Capital of the World—and is pleased to be able to share information about the tufted textile industry’s history and about her home state’s contributions to American fashion. She is a welcome addition to the Ornament contributorship, and in many ways its folk historian. David Updike is a writer and editor working for the Philadelphia Museum of Art, who occasionally donates his literary gifts to Ornament. With a cosmopolitan's appreciation for the universal, Updike brings a keen mind and a world-inclusive perspective to his articles, as well as a good head for research. His voice on topics ranges from the Philadelphia Museum of Art Craft show, museum exhibitions, and jewelry artists. He has written an insightful profile on jeweler Barbara Heinrich in the recent April issue of Ornament. Jo Lauria is an independent art/design curator and author living in Los Angeles, who tends to have her fingers in many pies. From producing and directing documentaries, to organizing exhibitions, as well as publishing proliferously, Lauria has been a major presence in the art and craft field. She is the former decorative arts curator at the Los Angeles County Museum of Art, where she specialized in contemporary craft, art, and design. From 2007 to 2009, she was the chief curator of "IN AMERICA: Expanding Traditions", a traveling exhibition which toured seven museums, and which served as the companion exhibit to the Craft in America series Memory, Landscape and Community. She also curated the exhibition "Masters of Mid-Century California Modernism: Evelyn and Jerome Ackerman", which appeared at our next door neighbor, the Mingei International Museum, San Diego, from March 2009 through January 2010. Leslie Clark is a freelance writer and editor in Santa Fe, New Mexico. Clark, who claims red is her favorite color, was flabbergasted by her visit to the “The Red That Colored the World” exhibit at the Museum of International Folk Art up on Museum Hill in 2015. “I had no idea how exhaustively people worked, for centuries, to produce a red color. No wonder kings and prelates hogged it for themselves. Cochineal changed everything. Even now, with synthetic dyes around, its amazing properties are still the best. It makes you grateful to Mother Nature and those little bugs.” Thus speaks Ornament's resident straight-talker.